A Lingfield, Surrey indie rock four-piece band (now based in Guildford and studying at the Academy of Contemporary Music) calling themselves “Sweet Revenge” delivered a superior performance at the Surrey Young Superstars Award this year, held at the upscale Guildford Harbour hotel on Sunday, May 8th. 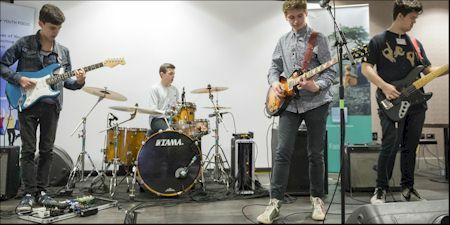 The young band won a contest organized by the Academy of Contemporary Music and Surrey Young Superstars, to be selected to play at this important local event celebrating young people of Surrey. The non-profit reward scheme is run by Haslemere Travel in collaboration with Surrey Youth Focus and supports local charity Cardiac Arrest in the Young (CRY). “Sweet Revenge” comprised of singer Freddie Wortley, Kam Stocks on bass, Max Thilo on guitar and Josiah Kirpalani on drums, have recently released a new track, entitled “Bite The Bullet.” They play bold and expressive self-written garage punk sounds that seem influenced by early British rhythm and blues. “Bite the Bullet” reminds us of Razorlight perhaps crossed with embryonic Rolling Stones.